Tuesday’s slate has an interesting mix of starting pitching at all levels. We have at least two truce aces on the slate with Jake Arrieta (CHC) and Jose Fernandez (MIA) scheduled to take the bump. Neither have particularly compelling matchups as Arrieta will face the Dodgers (19th in wRC+ against RHP, 16th highest K Rate) while Fernandez will get the Pirates (fourth in wRC+, 26th in K Rate). Both are priced appropriately which strains your salary cap on a Coors Field slate. Fernandez’s upside is higher due to the immense K Rate (39 percent or higher in four straight games, 36.7 percent on the season) but Arrieta’s run prevention and consistency makes him the safer target. Our lean is with the slight price discount and the strikeout upside with Fernandez, but both are very viable cash game targets. The second tier represents two starters who at times have pitched like aces in their careers. Steven Matz (NYM) is pitching like an ace right now. He’s generating ground balls (55.6 percent) and limiting hard contact (23.3 percent) while keeping walks way down (4.6 percent) and striking out 25.8 percent. His peripherals resemble Jake Arrieta and his ability to dominate opposite handed hitters (.245 wOBA, 25 percent K Rate, 3.5 percent BB Rate, 24.6 hard hit rate allowed as a big leaguer) makes him matchup proof. The White Sox are a slightly below average matchup (ninth in wRC+ against LHP, 14th in K Rate) but the park shift and loss of a DH leave them projected as slightly below average. Matz is priced appropriately which presents an interesting challenge. He’s the second tier starter you’re most comfortable with, but the price tag is close enough to first tier starters to inspire a decision. Gerrit Cole (PIT) is the tier two starter that has occasionally pitched like an ace in his career but is going through the worst stretch of his career. Cole’s swinging strike rates have been 8.5 percent of below in six of his nine starts this season. He’s had two games with a K Rate below 11.5 percent including a 0 percent effort against the Rockies. Still, six of his nine starts have been above 20 percent and he’s held opponents to two earned runs or less in seven of nine starts. The Marlins are pesky against RHP as they rank 15th in wRC+ but 22nd in K Rate. Cole’s price tag on DraftKings ($9,600) is enticing given the gap between his tag and the three starters ranked ahead of him. 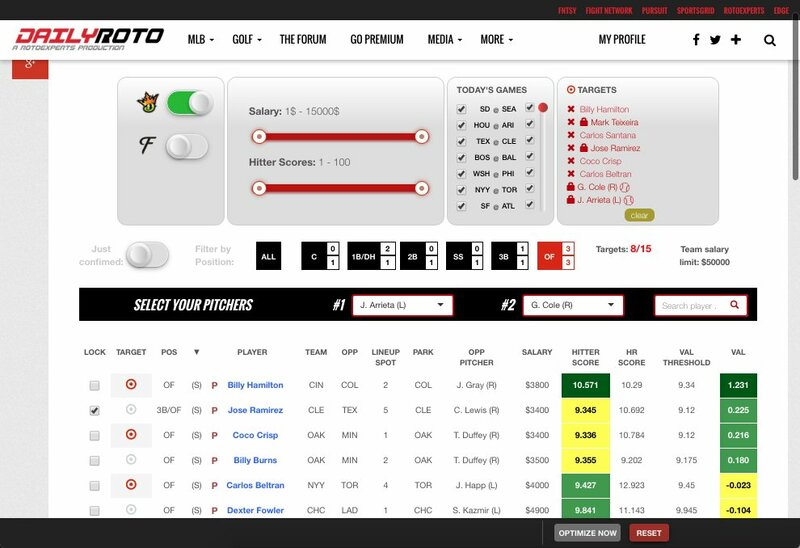 Expensive starting pitching comes with a bit of opportunity cost on this slate given Coors Field is in play with a total of 11 and four other games have a total of nine or higher. The challenge is none of the “values” inspire much confidence. Scott Kazmir (LAD) saw a big velocity jump last time out (92.4 mph avg FB) that led to a season best 14.3 K Rate, but a matchup with a Cubs offense that ranks fifth in wRC+ against LHP and 27th in K Rate is less than appealing. He’s also a huge underdog (+200) against Arrieta which brings more risk on the innings side as the Dodgers may be more likely to pinch hit early. J.A. Happ (TOR) dominated the Yankees last time out but is met with an implied run total approaching 4.5 runs at home. Anibal Sanchez (DET) has a similar implied run total against and faces an Angels’ offense that doesn’t strike out much against RHP (15.6 percent is lowest in the league) but also hits for almost no power (.131 ISO is third lowest). Sanchez has generated strikeouts (19.8 percent) but the long ball (1.78 HR/9) has killed him. Theoretically that should be less of a problem against the Angels but his strength is also less of a strength. Jake Peavy (SF) gets the hapless Braves but Peavy has allowed a hard hit rate over 35 percent in five straight starters and over 40 percent in four of those five. It’s a night that you want to find a cheap starter to latch onto on DraftKings, but all of them are uncomfortable decisions. Joe Ross (WAS) is probably the secondary starter with the best matchup (Phillies rank 27th in wRC+ against RHP and have the 11th highest K Rate) but the scuffles with lefties and modest K Rate limit the upside. The catcher position is a little watered down on Tuesday’s slate. None of our top options crack the Top 50 hitters overall, which once again places the emphasis on salary relief. Stephen Vogt (OAK) remains cheap on both sites and will have the platoon advantage against an average RHP. If another punt play emerges better than Vogt we’ll certainly hit on it in alerts, but he looks like your primary target. Opportunity cost is low, so in tournaments this is a great spot to be contrarian against Vogt’s likely high ownership and take chances on other cheap catchers perhaps in worse lineup spots but with power enough to pay it off in one swing. First base is top heavy again with Joey Votto (CIN), Edwin Encarnacion (TOR), and David Ortiz (BOS) all inside our Top 10 overall hitters. The Cardinals duo check in right around our Top 25 along with Miguel Cabrera (DET) and then we have a little fall-off. We were hoping for some softer price tags on Matt Adams (STL) and Brandon Moss (STL) but they’re priced close enough to Joey Votto and Edwin Encarnacion that it’s hard to prioritize them. As a result, we’re likely choosing between Votto and Encarnacion on both sites. D.J. LeMahieu (COL) is the first of many Rockies to top our rankings on this slate. They’re at home against one of the weakest starters on the slate in Jon Moscot (ZIPs projects a 5.52 rest of season ERA) and backed up by the worst bullpen in the league. Even at home, LeMahieu has a chance at five plate appearances on a team with an implied run total over six. Brian Dozier (MIN) ranks as our second best 2B option (assuming he hits first or second) as he’ll get a friendly matchup against Eric Surkamp (career .377 wOBA allowed to RHB). The real value we’re hoping to unlock with a good lineup spot is once again Starlin Castro (NYY). Castro is very cheap and should hit second with the platoon advantage in an elite hitting environment. At a position without a ton of opportunity cost, Castro gives you some salary relief to spend elsewhere. Second base also has some other value alternatives that would pop on our model if in the lineup (Cristhian Adames) or if in a good lineup spot (Devon Travis), so tune into alerts to see if values change. The Top Four shortstops actually rate pretty well in our model. Manny Machado (BAL) cracks our Top 25 with the platoon advantage at home against Eduardo Rodriguez. Aledmys Diaz (STL), Eduardo Nunez (MIN), and Zack Cozart (CIN) then crowd in around our Top 45. It’s easy to sort of let price help sort through the options. On FanDuel, Aledmys Diaz is a bit underpriced at $2,900 while Zack Cozart is reasonably priced on DraftKings ($3,600). Nolan Arenado (COL) is our top overall hitter on this slate. He’s the best hitter on the team with the highest implied team total and facing arguably the weakest opposing starter on the slate. Josh Donaldson (TOR) also ranks inside our Top 10 with a matchup against a LHP vulnerable to power (Sabathia – .370 wOBA, .179 ISO since 2015). The two are priced accordingly on both sites and make for a difficult decision with pricing tighter due to the SP options. Matt Carpenter (STL) falls just outside our Top 10 and his price tag on FanDuel ($3,500) throws him in the conversation as well. Carpenter gets Wily Peralta (.403 wOBA, .238 ISO allowed to LHBs since the start of 2015). With the strength of these options up top and very little compelling depth at the position, third base looks like a place to spend. The outfield rankings are unsurprisingly loaded with Rockies at the top. Charlie Blackmon (COL) and Carlos Gonzalez (COL) each crack our Top Five overall hitters and are our preferred outfield spends if you can afford them. Gonzalez’s price tag on FanDuel remains the most compelling ($3,900) of the two players across the two sites. Gerardo Parra (COL) comes with a little softer price tag than the other two stud outfielders and is a viable source of salary relief while getting Coors Field exposure on both sites. Billy Hamilton (CIN) would remain a really strong value on both sites if he’s moved back up in the lineup into the leadoff or second slot. Jonathan Gray is nasty but vulnerable to hard contact and he’s been vulnerable to the running game early in his career. Jose Bautista (TOR) is underpriced on DraftKings ($4,300). Michael Conforto (NYM) is pretty reasonable priced on both sites as well and represents a fine non-Coors Field approach to value. Adam Jones (BAL) remains affordable on both sites but takes a backseat with all the outfield depth on this slate. Given the nature of this slate, we’re hoping some more punt plays emerge that can open up more salary relief. Robbie Grossman (MIN) is a viable pure punt play on DraftKings. He doesn’t project as a very good hitter but is a switch hitter who has been hitting fifth a ton lately on an offense that is pretty good against LHP and Eric Surkamp is a weak opposing starter. The Rockies are so far ahead of the rest of the slate in terms of implied run total and it plays out in our stack score. The Reds bullpen exaggerates favorable matchups against weak opposing starters and the Rockies are deservedly the chalk stack on this slate. We want exposure where we can get it in cash games. The Reds are inflated in Coors and likely over-owned in GPPs thanks to it. Jonathan Gray is the Rockies best starter and while he’s vulnerable to hard contact, he’s made some strides of late. We prefer the St. Louis Cardinals in tournaments as they’re getting a huge park shift in their own right and facing a weak opposing RHP that is very vulnerable to power. The Blue Jays power always plays well against LHP and their ownership may get pushed down due to Coors Field and just recently getting shutdown by CC Sabathia. Baltimore Orioles – Eduardo Rodriguez wasn’t great in his minor league rehab (1.93 HR/9, 14.8 K Rate) and the Orioles sport a lot of RH power that comes with varying price points. Throw in Chris Davis who has power against LHP and is perpetually low owned against LHP and you’ve got the makings of a low-owned contrarian tournament stack with big power potential.